Alfred McLelland Burrage was born in Hillingdon, Middlesex on 1st July, 1889. His father and uncle were both writers, primarily of boy's fiction, and by age 16 AM Burrage had joined them. The young man had ambitions to write for the adult market too. The money was better and so was his writing. From 1890 to 1914, prior to the mainstream appeal of cinema and radio the printed word, mainly in magazines, was the foremost mass entertainment. 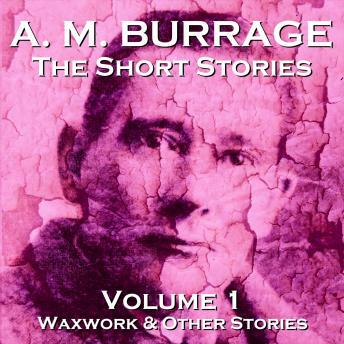 AM Burrage quickly became a master of the market publishing his stories regularly across a number of publications. By the start of the Great War Burrage was well established but in 1916 he was conscripted to fight on the Western Front. He continued to write during these years documenting his experiences in the classic book War is War by Ex-Private X. For the remainder of his life Burrage was rarely printed in book form but continued to write and be published on a prodigious scale in magazines and newspapers. In this volume we concentrate on his supernatural stories which are, by common consent, some of the best ever written. Succinct yet full of character each reveals a twist and a flavour that is unsettling.....sometimes menacing....always disturbing.